Indian market is now flooded with budget smartphones and most of the smartphones are powered by MediaTek processor. The companies like Karbonn, Micromax, Xolo etc have already brought devices utilizing the MediaTek MT6572 and MT6582 chipset. Many people are confused about these different chipsets and what difference they make in a smartphone. We give you a quick answer and a overview of these processor based on different factors. 28nm process is a standard in all MediaTek chipsets starting from the low- end dual-core MT6572 or high-end eight-core MT6592. MT6572 and MT6582 which is the use of a common 28nm process. But the Advanced Edition Quad Core MT6588 and MT6592 uses the 28nm HPM process, HPM stands for High Performance Mobile, which means low- power mobile high-energy processes which also enhances battery life. Both the MT6572 & the MT6582 utilizes a 1.3GHz frequency & L2 cache. The Advanced version (HPM) MT6588 is clocked at 1.7GHz and it’s a quad core processor. MT6592 which is first Octane core (Eight core) processor use an optional 1.7 ~ 2.0GHz frequency which means that there will be two variants of this chip just like the previous MT6589 chip. And L2 cache upgraded to 1MB from the 512kb. The MT6572 & MT6582 are still based on the LPDDR2 while the Advanced version quad-core and eight core MT6592 and MT6588 increase LPDDR3 666MHz support. LPDDR3 when compared to the LPDDR2, brings in higher data transfer rate, bandwidth, energy efficiency, storage density, such as data rate of 1600Mbps, than their predecessors LPDDR2 1066Mbps add a whole half. Only Premium quad-core and octa-core MT6588 and MT6592 supports HEVC/V9 coding standards . HEVC which stands for High.Efficiency Video Coding, is a new video compression standard. With HEVC support one can enjoy a higher quality of 4K video, 3D Blu-ray, high-definition television.programs. In the decoding.department the MediaTek MT6592 decoding HEVC (H.265) FHD video consumes less power than the existing market quad-core solution for low 18%. In.playback mode, MediaTek MT6592 can provide users with 20% frame rate.improvement which ensure a much smoother experience. ARM Mali 450-MP Die area of 8.6 mm2, based on quad-core design, built-in 256 KB L2 shared cache, running at 240MHz (40nm LP) or 480MHz (40nm GP), running at 480MHz speeds, the data throughput up to 104M triangles / s. In 4xFSAA (FSAA) mode, Mali 450-MP can provide the quality 2K and 4K display, support OpenGL v2.0 and OpenVG 1.1 effects. All this results in better frame rates while video playback, gaming and other graphics intensive tasks. The lower end processor like MT6572 supports only up QHD 540×960 pixels resolution as this used are in very low budget devices, MT6582 supports 720p HD display at its max. Higher end processor like MT6592 and MT6588 will support Full HD 1080p displays. So in conclusion you will get a phone with these chipsets according to your budget and also.what you are willingv ttoo pay for. The phone starting from Rs. 4000 to Rs 7000 are mostly featuring a MT6572 chip. 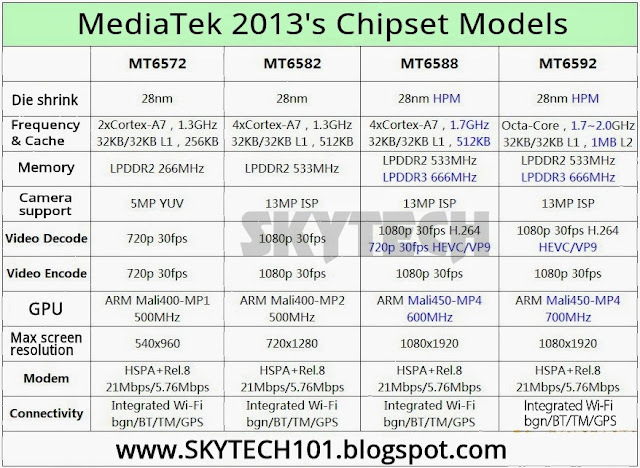 And phones under 8-15 thousand will have a MT6582 or MT6588 chipset. And the devices above Rs. 15000 are more llikely to have a Octa-Core MT6592 chipset at its heart.